Simply seasoned shallots that pair great with curries. Comes in a single-use package that’s easy to use. Each bag has a net weight of 150g (contains about 30 pieces). These shallots have been marinated in a simple blend of sugar, brewed vinegar, and salt. From the same family as garlic and onions, shallots have a milder flavor than their cousins and have been used in Southeast Asia, the Middle East, and Europe for centuries. 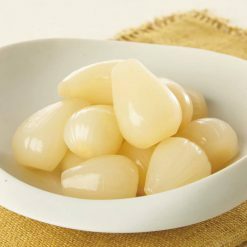 Though bulbed like garlic, their taste profile is more similar to that of onions. They contain significant amounts of dietary fiber, vitamins, and minerals, including notably amounts of both potassium and iron. They’re also known for their variety of anti-aging and cancer-fighting antioxidants. Our shallots are ready to eat, and can be served immediately after removing them from the bag. (Transferring the liquid along with the raw pickled material will make it keep for longer and and prevent drying out. )Shallots are favored for their mild and inviting taste, and for the subtle flavors that come out during their caramelization.Given their similarities, shallots can be used in place of (or addition to) garlic and especially onions in many dishes. From fried rice, to pasta dishes, to even hummus, the sky’s the limit when it comes to experimenting with and enjoying them. 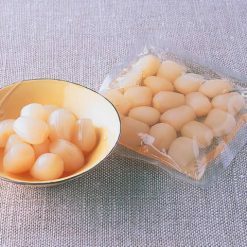 This product contains shallots (China), marinated raw ingredients (sugar, brewed vinegar, salt, honey) (includes raw wheat). Origin of ingredients: shallots (China). Prepared and packaged in Japan.